I haven't been buying as much wine the last few months as I have in the past. Perhaps you're like me in that you've got more than enough wine on hand yet have a hard time finding bottles under $20 you're interested in (let alone enthusiastic) about opening? Part of the problem is I've done more buying online lately - usually in response to email offers from retailers and wineries. When buying online, I often go for wines in the $30-$50 range that retail for much more, and where shipping costs are easier to absorb. But the result is I've got more than enough "pricier" wines and not enough daily drinkers I'd like to open. And as a result I'm popping $30+ bottles without really enjoying them as much as I should mostly because I'm not paying close enough attention to them. So as much as I don't want to spend more money, nor add more bottles to my stash, there comes a point when it makes sense to get out there and buy some affordable and hopefully interesting wines locally. Yesterday I swung by the Costco in Dedham, MA to pick up a few things and decided to check out the wine assortment. I know Costco isn't exactly the place to be for eclectic wine buys but hey I was there so why not check out the wine selection, right? At this Costco the wine is sold in an attached but separate store run by KH&H Liquors. The assortment and prices are similar to what you'd find at most Massachusetts Costcos, like Waltham for example where the wine is sold by Costco "for real". A Tweet on a bottle of wine. Don't think I've seen that before! 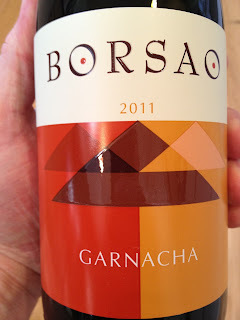 I picked up 5 different bottles of wine, one of which was the 2011 Borsao Garnacha for $6.99. 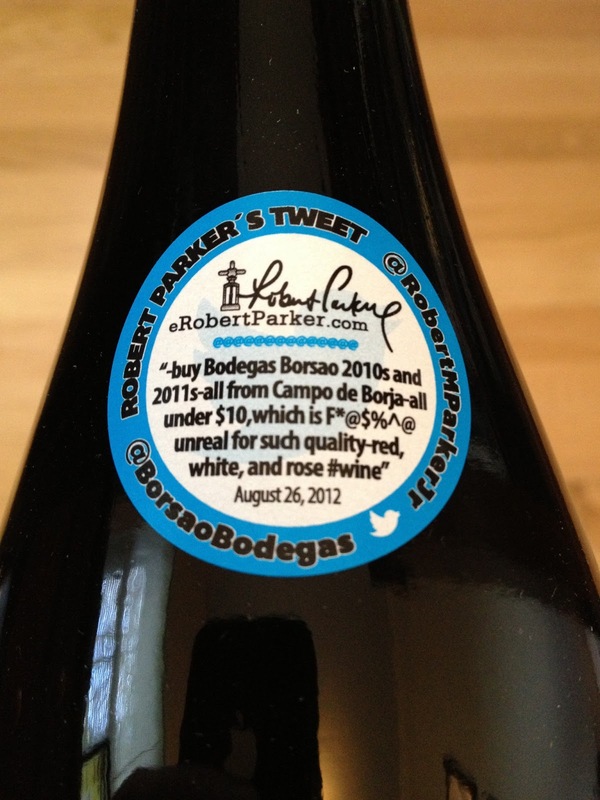 I seem to recall Parker doing a special feature on the wines from importer Jorge Ordonez's portfolio last year. Much of what we hear about Robert Parker these days involves tumultuous times at The Wine Advocate so I hardly recall the last time I bought a wine based on one of his recommendations. But I've had good experiences with other wines from Ordonez, and Borsao specifically has stood out. This one was quite a bit under $10 but the Borsao Tres Picos is closer to $15 usually. They pour Tres Picos by the glass at The Capital Grille and it's a great buy as well. 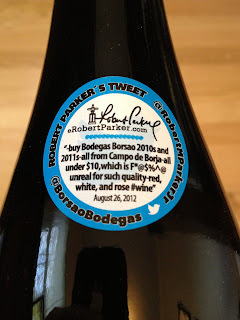 And I've enjoyed the Borsao Crianza Seleccion too (though it's usually closer to $20). 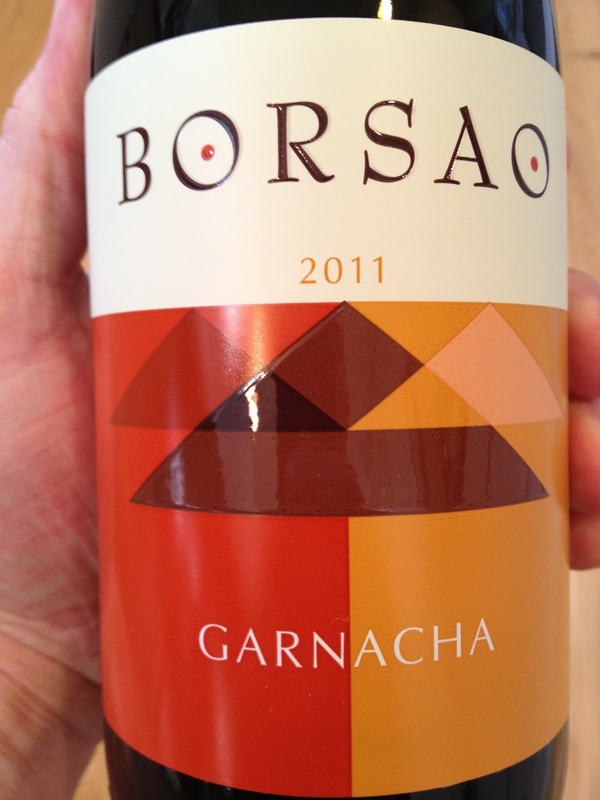 I popped the 2011 Borsao Garnacha last night. I thought it was really good. It's medium to full bodied, and heavier than most other Grenache-based wines I've tried. It's aromatically pleasant and full of flavor. It improved noticeably after breathing for an hour. It was 80% as good as most of the spendier bottles I've been opening through lately. I'd rate it 88 points. For $6.99 it's a great buy. If you like California Cabernet Sauvignon, try Spanish wines. In Spain, they use American oak barrels. You get a lot of fruit, coconut, and dill. If I have someone ask me at the restaurant for a good Cabernet for around seventy dollars, with our mark-up, we can't do it. However, I can certainly offer them something similar in flavor and texture from Spain. So there you have it. Definitely check out Spanish wines if, like me, you gravitate towards the flavor profile of Californian wines but would look to explore different regions with a similar style and you're seeking value. For me, they're a better play than Australia, Argentina, or Chile. Question of the Day: What region are you exploring for value right now? Massachusetts Only: Epic California Pinot Noir Deal! The great thing about having a stash of wine is that you only have to swing at the perfect pitches. In comparing notes with many of my pals who go in on wine deals with me, a lot of us are in a similar boat: We've got a lot of wine on hand but we're lacking in $15-$25 wines we're excited about opening. For those of us interested in luscious, outstanding California Pinot Noirs there's only so much Meiomi one can buy. We need variety. And that's where deals like this one comes in. Julio's Liquors in Westborough, MA (full review) is offering the 2008 Saintsbury Brown Ranch Estate Pinot Noir for $20. The release price of the wine is $60. Though rated "only" 87 points by Wine Spectator, the current CellarTracker average is 91.1 points. Judging from the notes this is a full bodied, fruit forward Pinot Noir. I've enjoyed a number of Saintsbury appellation-level Pinot Noirs over the years, most recently the 2009 Carneros bottling. But I've not been interested in paying $60 for their single vineyard bottlings. CellarTracker community average price paid is $51.60 and the best current price nationwide according to Wine-Searcher is $42.99 with most retailers selling this in the $50s. So this wine is indeed supporting the $50+ price point and this is a great opportunity to catch it at a great price. As of this morning there were 27 bottles available (31 before I ordered 4). I'm not sure what they charge for shipping but Westborough is pretty centrally located for in-store pick-up so that's the way most of us will go I think. I'll update this post if I hear they're gone. Act fast! Update: This offer sold out by noon. Follow me on Twitter @RobertDwyer or "Like" The WWP on Facebook for faster notifications. Like hearing about deals like this? I'd love it if you subscribed to The Wellesley Wine Press for future updates.